Other students nodded vigorously as they made their way out the door of the small, black box theatre. This was where my colleague Andrea McCloskey and I held a weeklong summer improv camp. We taught fifteen 7th-12th graders how to improvise. We’d just staged an hour of improv for an audience of parents and friends. The crowd hooted and hollered as our students participated in a variety of improvisational forms, the central being a montage. Montage is a long form improv format made up of a series of scenes of no particular structure based off a single suggestion. Sometimes actors explore global warming. Sometimes aliens. Sometimes something else. Anything goes in a montage. I’ve heard enthusiastic comments such as these from students like Sarah and parents like Ian’s mom hundreds of times. I’d been directing and teaching improv for nearly fifteen years before teaching this group last summer. In only a week, this group of people came together through improv to create a unique community. Participating in communities such as these always seems to have a powerful effect on people, especially if it is facilitated, taught, or directed with care. Improv is an art form in which performers co-create a spontaneous, theatrical performance. Actors work in groups to create unscripted and unrehearsed scenes. Improv has been made popular as a comic form, and many people are familiar with the television show Whose Line is it Anyway? Still, improv is not inherently comedic. In fact, longform improvisational theatre, the kind I’m most experienced with and discuss here, is more about creating and embodying collective stories. The stories may be comedic yes, but they are just as likely to portray and provoke other affective responses. People often associate improvisation with spontaneity or impulsivity. This is true but, in fact, I’ve found that improv is a disciplined art that must be supported by teaching and practice. (5) perceives, accepts, affirms, and builds off the offerings of all other participants in the improv. These are difficult traits to learn, let alone embody. Further, it is necessary for a group of improvisers to trust each other without hesitation. They need to achieve group-mind. Collective consciousness. A week before the performance mentioned earlier, I had scanned the room. Sixteen intimidated, quiet 7th-12th graders sat before me in a small, black box theatre. Students were skeptical as I asked them to put their cell phones in the corner of the room, stand up, and spread out across the room. I had them close their eyes and breathe deeply three times in order for them to become present. Soon these teenagers were standing in a circle playing improv focus games such as Zip-Zap-Zop, Improv Gifts, or Vroom. They authored collaborative stories by adding one line at a time to practice the improvisational ethos of ‘Yes, And’. Next, I had students practice a character walk where they imagined and embodied characters based off words I gave them as they moved around the space. By the end of the first day, students were authoring spontaneous three-line scenes together. All of these activities supported the objective we had for our students – to participate in sustained improvisations. We followed a similar process over the next four days, allowing students to grow more comfortable extending their improvised scenes. Slowly, we taught them the rules of different long forms we might use for our show. 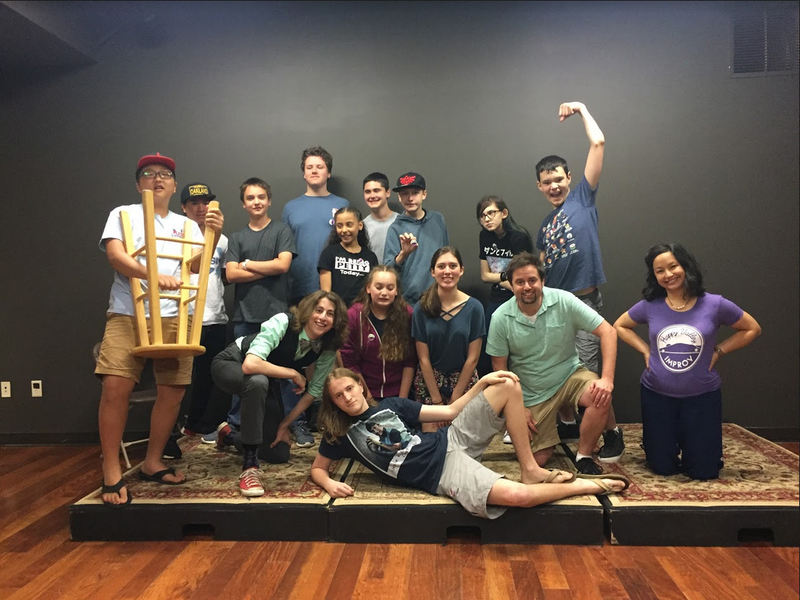 The students acclimated to the work of improv and, more often than not, were laughing riotously at the surprising things that were happening in our improvisations. They authored and embodied stories about doctors, fairy Godparents, teachers, etc. It was almost surprising to them that, in fact, they were ready to perform for an audience after only a week. The way I teach and direct improv has evolved over the years to prompt my students to practice the way of being described above. I’m cautious to organize classes and rehearsals so that students don’t have the opportunity to critique their peers, thereby undermining the trust I know they need to have in each other. Activities require participants to affirm each other and avoid imposing preconceived notions in scenes, activities, or games. These same precepts have come to deeply inform my teaching in other contexts. I’m careful to affirm and add onto the ideas of writers in writing workshop, open to divergent thinking when studying a text with students in an English class, and careful to avoid situations in which students might critique each other’s work. Indeed, I often use some of the activities described above to create a supportive community before facilitating writing workshop or a group discussion. Others have also looking to improv to find exercises to aid the work of teaching English Language Arts. I see benefits in this work but, for me, improvisation offers more than a discrete list of games or activities to be used in isolation. Instead, I’ve learned that improv can teach us to listen deeply to ourselves and each other. Improv requires us to affirm and discover our individual and shared creativity. Good improv is more about adhering to a collaborative and open way of being than participating in a specific game or exercise. I’ve come to think of improv, especially as a teacher, as a remarkable way to foster group connections. Improv has come to fundamentally inform my practice as a classroom teacher as I work to achieve and sustain the way of being described throughout this blog, what I’ve come to think of as an improvisational ethos. What’s so special about improv? People have to be vulnerable, trust each other deeply, and be powerfully present for improv to work. Teaching improv isn’t a matter of presenting or imposing knowledge, it’s the work of creating a shared and disciplined community in which participants discover and create content. Improvisers fail or succeed together. Members are responsible for making sure their participation in an improv community doesn’t depress the life of the group. And the life of the group, if tended to, comes to be unique and powerful. Carefully weaving elements of improv into my writing workshops or ELA classrooms have allowed me to affirm student’s work, create spaces where the community supports each other, and facilitate emergent learning. I gravitated to improv over the years, not because I’m a student of comedy, but because I’ve come to see the artform has the potential to be a radically liberating way of being. There isn’t a right thing to say, do, or know in improv. There’s no right way to be. Anything might happen in an improv scene. Learning how to inspire students to embrace and affirm this profound, collective freedom feels like important work, especially during a time when people seem more and more isolated from each other. If nothing else, improv requires us to be in deep, material relation with others. I was reminded of how sorely we need such spaces as I once again taught teenagers how to improvise this summer. Sam Tanner is an assistant professor in the Penn State system. He is also a writer, an improviser, and a father.